George W. Cork, a retired agriculturist, came to Monona County in the spring of 1869 and settled on a farm on section 10, Belvidere Township, where he was actively engaged in farming until March, 1887, when he came to Onawa and there he has since been living a retired life. He at first purchased some two hundred acres which were partially improved, to which he added from time to time until he owned one thousand acres. He has since disposed of a portion of this but is still the possessor of some seven hundred acres, which are well improved with good buildings, and watered by the Little Sioux and Maple Rivers. This is one of the finest stock farms in the county, he having devoted himself extensively to that interest, and had the reputation of being one of the heaviest hog raisers in the county. Mr. Cork was born near Chilicothe, Ross County, Ohio, January 27, 1822, and is the son of John and Rebecca (Raby) Cork, natives of Virginia. His parents had emigrated to Pennsylvania and Ohio in an early day and settled in Ross County, where they remained until 1834, when they took up their residence in Union County, where the father died in 1843, aged forty-nine years. The mother died in Delaware County, the same State, at fifty-eight years of age. George W. Cork, the grandfather of our subject, a native of Virginia, of German descent, died in Ross County, Ohio, about 1836, aged seventy-five. His wife, Susan, died in Marshall County, Illinois at the age of eighty-five. Our subject removed with his parents to Union County when about twelve years of age, and was reared upon a farm, receiving his education in the subscription schools of the period and helped clear up the farm, which lay in the heavy timber common to that region. He remained at home until attaining his majority when he purchased a tract of land and engaged in clearing it up and making it into a farm. There he remained until 1851. Selling out, he then removed to Henderson County, Illinois and engaged in farming and made his home until coming to this county in 1869. Mr. Cork was married, February 22, 1844, to Miss Lydia Yarrington, a native of Carroll County, Ohio, born September 15, 1825, and daughter of Ephraam and Elizabeth (Hendricks) Yarrington, native of Pennsylvania. Her parents were early settlers of Carroll County and moved to Union County about 1838. In 1853 they emigrated to Bureau County, Illinois, where they died, the mother in 1857, and the father in 1870. Mr. and Mrs. Cork have had a family of eleven children: John N., born April 27, 1845, who died August 30, 1858: James H, born June 12, 1846; Eusebia, August 9, 1847: Thomas J, November 6, 1848: Solomon H, January 20, 1850: Francis M, December 9, 1851; Theodore, May 18, 1853; Mary, August 15, 1856; George W., April 21, 1858; William S, born December 3, 1859, who died January 9, 1872; and Ephriam R, who was born February 10, 1864, died December 7, 1871. Mrs. Cork united with the Methodist Church at the age of twelve years, but on the conversion of her husband in Illinois, they both associated themselves with the United Brethren. Since coming to this county they have again taken an active part in the Methodist Church affairs, and Mr. Cork was the first Superintendent of the pioneer Sabbath school of Arcola, in 1869. Mr. and Mrs. Cork remained in Union County Ohio until 1852 when they sold out and moved to Henderson County Illinois. They made their home on a farm until the spring of 1869, when they moved to Monona County Iowa and settled on Section 10 in Belvidere Township. He was engaged in farming until 1887, when he retired and moved to Onawa Iowa. He first purchased some 200 acres, which were partially improved. He added to this from time to time until he owned 1000 acres. When he retired, he had disposed of a portion of this, but was still the owner of 700 acres which were well improved and watered by the Little Sioux and Maple Rivers. His was one of the finest stock farms in the country. He, having devoted himself extensively to that interest, had the reputation of being one of the heaviest hog raisers in the County. 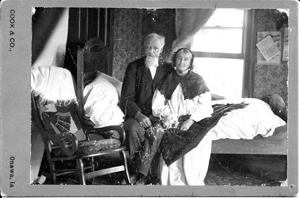 Mr. and Mrs. Cork were both raised in the Methodist faith but, in Illinois, they associated themselves with the United Brethern. After coming to Monona County, they again took an active part in the Methodist Church affairs and he was the first Superintendent of the Pioneer Sabath School of Arcola, in 1869. Mrs. Cork died June 9, 1898 and Mr. Cork died May 21, 1905. Both are buried in Cork Cemetery, located on their home farm at Turin Iowa. Mr. Cork, prior to his death had donated this land to the township for a cemetery. Mr. Cork’s obituary shows he never figured very conspicuously in public affairs. His religious activities for several years were very prominent. The Methodist Church of Onawa owes him a very large debt of gratitude for the material assistance which he rendered for many years. He was the most able and generous member of the church and he seldom if ever refused to meet any demands which were made on his time or purse. He was also a very active temperance worker during prohibition time. He was the terror of bootleggers and probably closed more holes-in-the-wall and prosecuted more bootleggers than any other man in the county. His private charities were more than most people knew. The writer of this notice, Mr. W. A. Green, for several years, lived next door to him. He knows of many charitable acts which were never published to the world, especially were the suffering poor in winter. The recipients of his charities, what ever influence he had, was thrown upon the side of morality and good citizenship and in his death, Onawa and Monona County has lost a pure man, a good citizen, and one whose memory will long be honored. John Nelson Cork is buried in Illinois. The last two children named are buried in Cork Cemetery at Turin Iowa.